The Iowa State Energy Code (661 Iowa Administrative Code, Chapter 303) applies to all commercial construction, whether new construction or construction work on existing buildings. These requirements also apply to all new construction of one and two family residences in the state, but not to renovation or remodeling of one and two family residences. Iowa Code Chapter 103A affords local jurisdictions discretion to adopt other building codes or no building code at all. 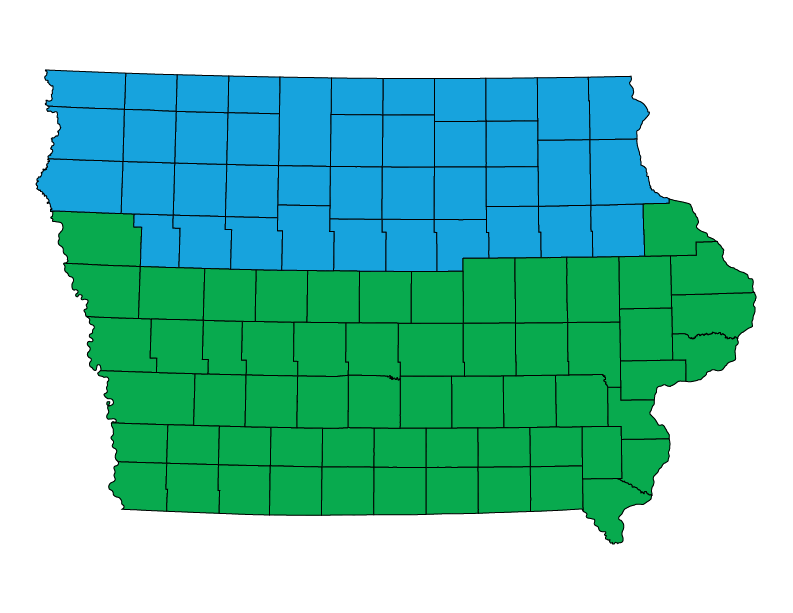 However, it also establishes that certain portions of the State of Iowa Building Code, including energy conservation requirements, apply to construction statewide (local jurisdictions are allowed to adopt the latest edition of a nationally-recognized energy code in lieu of the requirements in the State Building Code). Code updates are initiated by the Iowa Building Code Commission within the Building Code Bureau of the Fire Marshal’s Division of the Department of Public Safety. Iowa Code section 103A.14 created the Building Code Advisory Council, a seven-member body appointed by the governor. Iowa’s code update process is concurrent with the three-year ICC model code update cycle. Iowa publishes its state energy plan, which includes objectives and strategies relating to energy efficiency in buildings. The Iowa Building Code Advisory Council, after previously issuing a notice of intended action (NIA), approves the adoption of several amendments to the State Building Code, including the adoption of the 2009 IECC effective April 4, 2014 with a grace period until June 1, 2014. There are four amendments to the residential code, primarily put in place to make it easier to use in both climate zones. The Iowa Building Code Advisory Council, after previously issuing a notice of intended action, approves the adoption of several amendments to the State Building Code, including the adoption of the 2009 IECC effective January 1, 2010 (with a three month transition period during which the previous code, the 2006 IECC, may still be used). Residential sprinkler requirements are pushed back until January 1, 2013. Governor Culver signed Senate File 485 into law, creating the Iowa Climate Change Advisory Council (ICCAC). The ICCAC was charged with creating a plan to reduce greenhouse gas emissions. The state worked closely with the Center for Climate Strategies (CCS) and complete the plan in December 2008 which included recommendations to improve the building energy code.In addition, Iowa signed on to be a member of the Midwest Greenhouse Gas Reduction Accord which was signed by nine governors and two Canadian premiers in 2007 in recognition of the impacts that the Midwest has on climate change.ion of the MEC and its successor code, the International Energy Conservation Code (IECC). The first energy code is established, based on the National Conference of States on Building Codes and Standards Model Code for Energy Conservation. Since that time, the Iowa building code has been updated based on the latest edition of the MEC and its successor code, the International Energy Conservation Code (IECC). The General Assembly of the state of Iowa passes House File 6, an Act to institute an Iowa building code to ensure the health, safety, and welfare of its citizens. House File 6 became known as Iowa Code Chapter 103A.